To create a new queue, we recommend to use Auto Setup for all typical standard processes. It allows to create hot folders automatically and to assign the corresponding configurations. 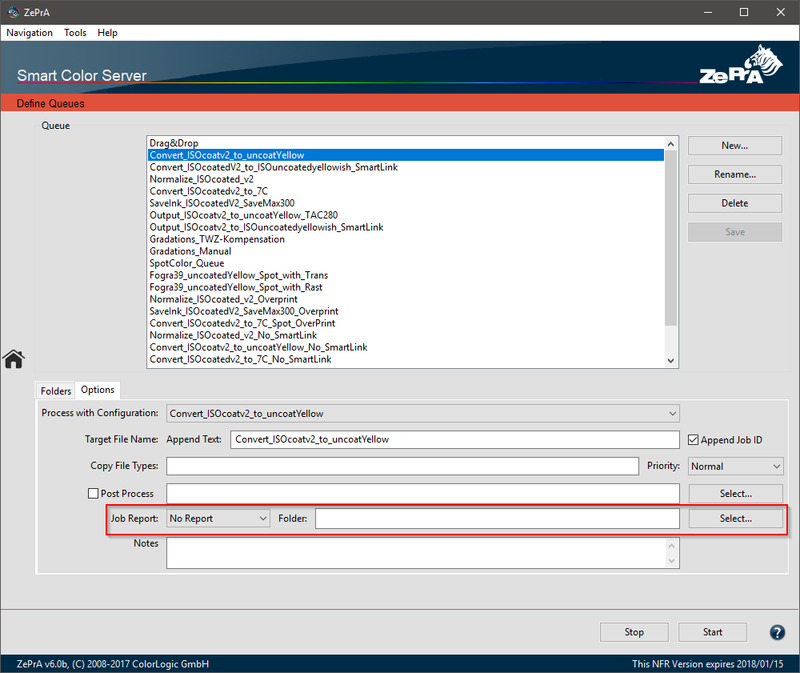 Additionally, when using ColorLogic’s standard DeviceLink profiles the Auto Setup Wizard fills in all relevant PDF/X information automatically. To create a new queue, a Base Folder must be created, a Configuration must be assigned and a Name must be specified. The button New in the tool Queues allows to manually create and name a new queue. 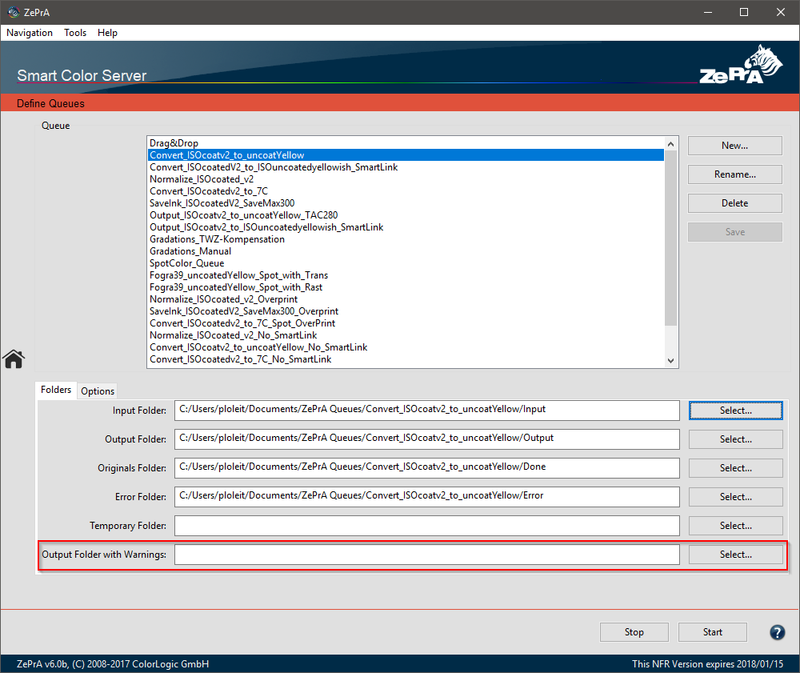 To configure the new queue, first select the queue and then the configuration from the drop-down menu Process with Configuration in the tab Options. Save the files to be converted in the Input Folder of the desired queue. Converted files can be found in the Output Folder. If a file cannot be processed, it will be placed in the Error Folder. 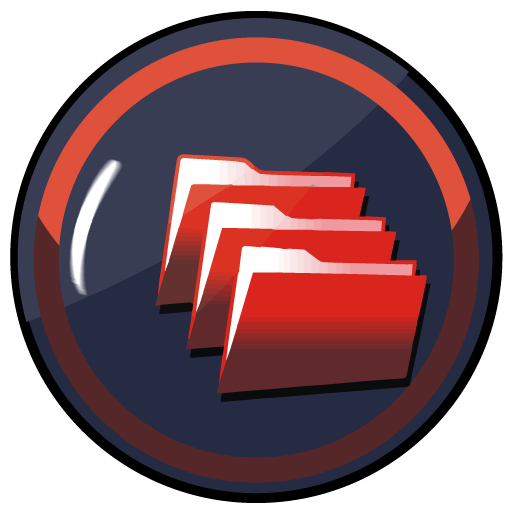 Files which could be processed but might have an issue are placed in the Output Folder with a warning message. To modify, shorten or add a suffix to an original file name, view Target File Name: Append Text. Append Job ID generates a unique, consecutive number and appends it to the original file name. If this function is disabled, ZePrA will automatically overwrite a file in the Output folder if the same file is converted again. Transfers control files such as JDF, XML, TXT or similar file types. Enter the file types in the text field or multiple files with a comma in between. If a control file has the same name as the processed file, it is copied to the Output Folder and moved to the Done folder. Delay (s): Processing of a job can be delayed which may be necessary if large files are copied to hot folders shared via the network using a slow connection. Enter the duration of the delay in seconds. Priority: The order of the jobs to be processed is determined by their priority. Change the Priority by right-clicking on the queue and change its default setting Normal to High or Low. 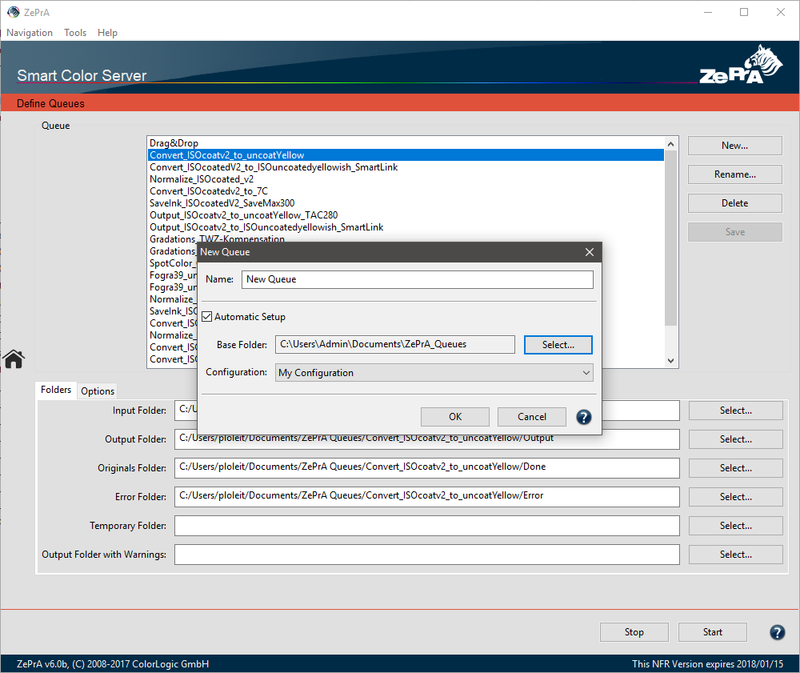 After color conversion in ZePrA, a file can be further processed using the function Post Process. 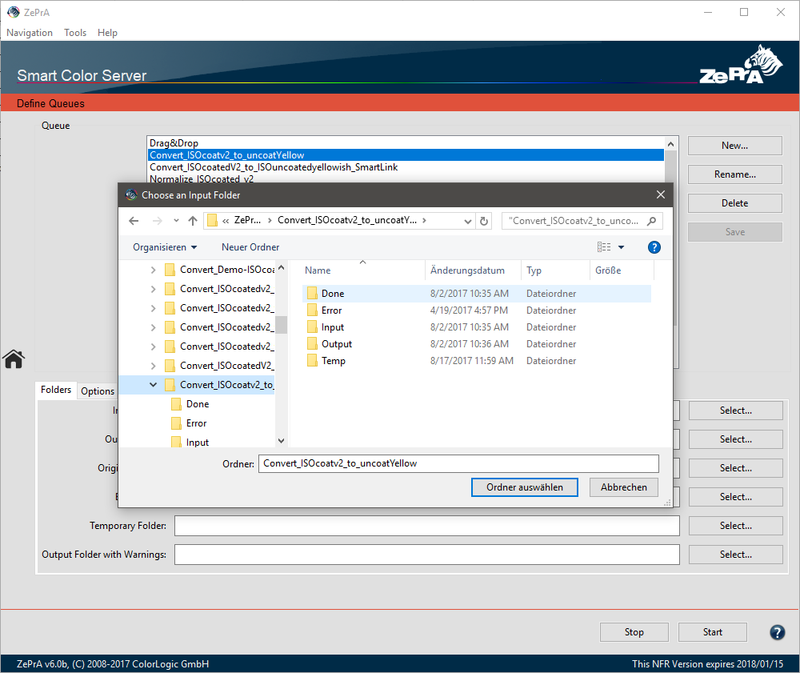 Enabling the Post Process checkbox allows each file in that queue to open in an external application for further processing. This function is not available for drag and drop queues. 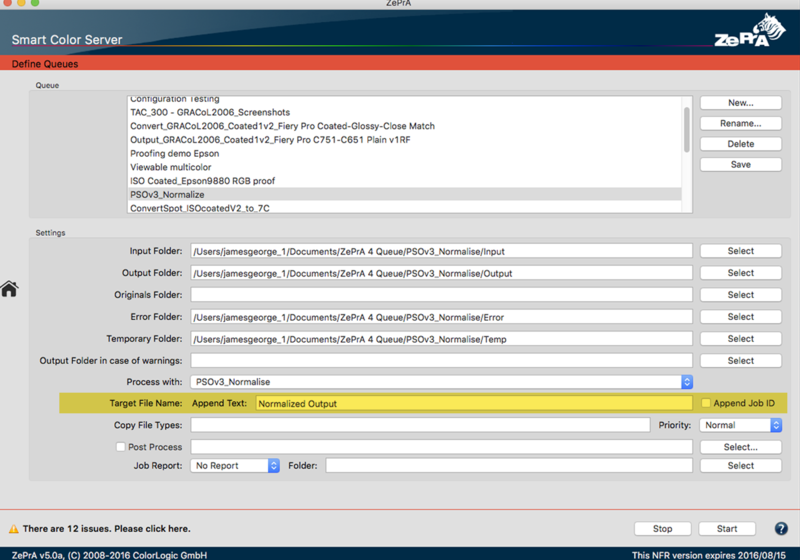 Automatically create a job report for each individual converted file. Once a job report is created, it will be saved using its original filename and the suffix REPORT. Under Folder select the location. We recommended creating a new report folder. Files with a yellow warning in the overview window have been processed but may have an issue. Usually they will be placed in the Output Folder. Alternatively you can define an additional Output Folder with Warnings when configuring the queue which will then receive such files after processing. 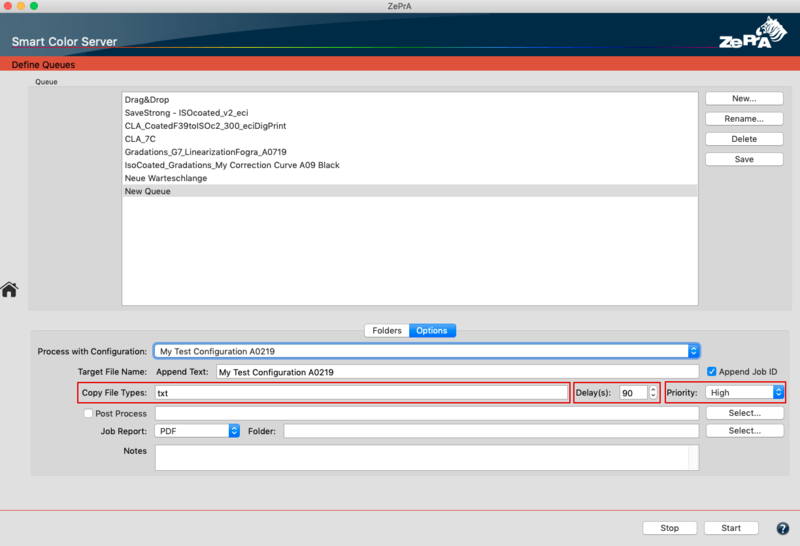 Entering Notes are relevant when processing many Queues, Configurations and jobs in ZePrA. As an example, add output device information, substrates or customers with Queues, Configurations or Processed Jobs, which can later be found quickly and easily by conducting a search in the window Overview.